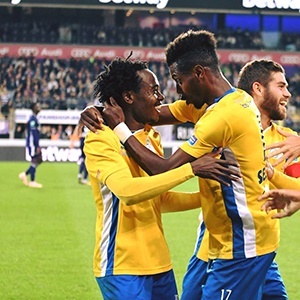 Cape Town - Percy Tau grabbed a brace in a 3-2 win over Royal knokke as Union Saint-Gilloise reached the Belgian Cup quarter-finals for first time in 50 years at the Joseph Marien Stadium, on Thursday. Union Saint-Gilloise clinched a home win thanks to a second-half double by the former Mamelodi Sundowns attacker, who scored the second and third goal to seal victory. The home side took an early lead in the 12th minute before Royal Knokke - who play in Belgium's third division - equalised just before the break in the 42nd minute. The Bafana Bafana international then in the second-half grabbed the game by the scruff of the neck, by restoring the home side's lead in the 59th minute before doubling the lead ten minutes later. Union Saint-Gilloise will now face Belgian first division leaders, Genk in the next round after reaching the quarter-finals of the Belgian Cup for the first time in 50 years.